Pizza Hut's a big brand with lots of followers, but that doesn't mean it's easy for them to come up with something that gets tons of engagement. They face the same challenges as anybody. 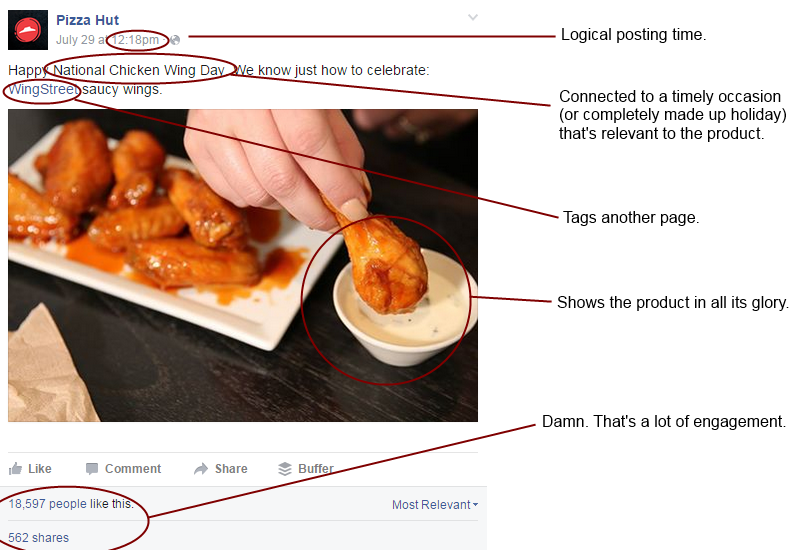 Back in July, they had a minor hit with a dumb photo of a chicken wing dipped in (what appears to be) a cup of ranch. S'pose it could be blue cheese. Great. So what made this get nearly 19,000 likes and 600 shares? Pizza Hut following some pretty good practices for their posting. That's what. Post at a time that makes sense, like when people typically use your product/service, or when your user base is going to be checking social media. You want people to see the post and you want it to resonate as much as possible. Tie your post into a current event or holiday - in this case, the "holiday" connected directly to Pizza Hut's product. It hardly has to make sense - in fact, the odder and less well-known the occasion, the more it might catch on. You can find examples all over the place. Tag another page when appropriate. In this case, Pizza Hut tagged one of their brand's sister pages, but you can also tag pages that belong to other brands or people you're mentioning in the post who connect to the content in some way. It will help draw attention to the post and possibly spark some discussion. Show the product! 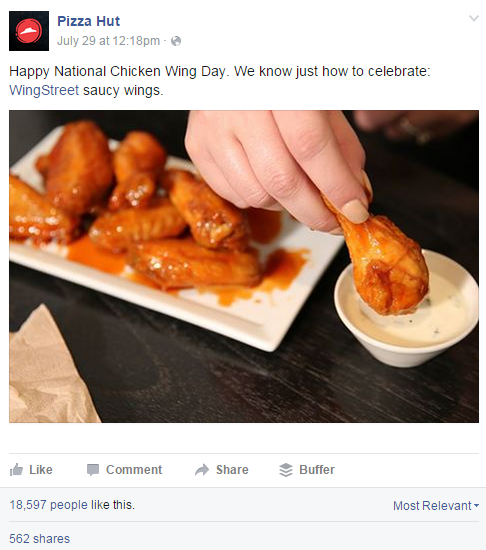 Hey, Pizza Hut's wings look pretty appetizing when its lunchtime (and it's what the post was about anyway). It's okay to show people using your product or service when it makes sense. Stay tuned (or subscribe below) for more Nice Posts and tips for your own posting.